Converting your eLearning courses from Flash to HTML5 can be stress free! This seven-step guide to getting started on your HTML5 conversion will help with the planning required to ensure your migration before the 2020 deadline. An outline of the steps required for planning a successful HTML5 conversion. Tips on which HTML5 eLearning authoring tools to engage. 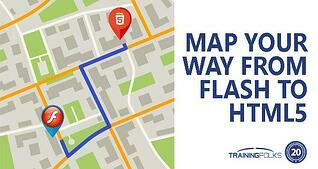 Key organizational benefits of making the shift from Flash to HTML5. Requirements to ensuring minimal disruption to your current training objectives before the 2020 deadline. Remember to get in touch with the corporate training experts at TrainingFolks for additional help with any aspect of your HTML5 conversion including needs assessments, conversion, LMS and instructional design.